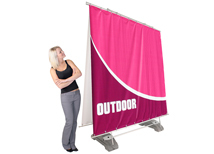 NWCI offers a large selection of outdoor display products. 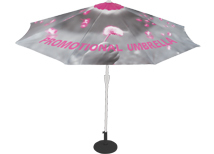 We have everything you need to market your products and services outdoors. We have a large selection of portable event tents and outdoor banner stands. Outdoor displays are designed to hold up under severe weather conditions including wind, rain, and heat. 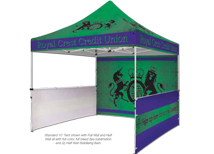 We only use outdoor grade graphic materials that will not tear or fade with repeated outdoor use.The outdoor canopies we carry are designed to be very portable and can even incorporate graphic prints into the tent material. Our selection of outdoor banner stands includes weighted banners, outdoor flags, and billboards. All outdoor banner stands use outdoor grade graphic material that will hold up to the elements. Outdoor canopies are great for outdoor events. These multi use tents can be used for farmers markets, outdoor retail stands, outdoor events, and weddings. You can incorporate graphics to make your tent unique! 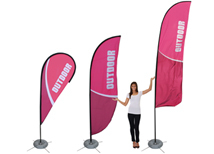 Outdoor flags are a great outdoor marketing tool. These flags can be as tall as 20 feet which will make a statement at any trade show or store front. Outdoor fabric material is used which is lightweight and heavy duty. Outdoor billboards can be used for any outdoor event. These billboards work great for outdoor fairs and outdoor marketing. We use a heavy duty outdoor vinyl material that will not fade or crack. 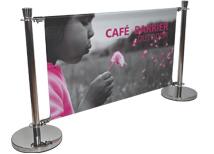 Cafe barrier banners are great for crowd control and branding opportunities at events. They can be linked together to and used for any size event. Custom printed in done on outdoor material for use inside and out! All of our outdoor trade show displays are designed for heavy duty outdoor use and are stocked by US manufacturers. Outdoor displays are great for marketing your brand or product in outdoor situations. There are many advantages to using outdoor displays because they hold up under wind but can also be used indoors. 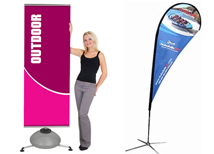 We also carry a full line of banner stands and retractable banner stands for indoor use. These banners are more affordable than outdoor banner stands and can be used at a trade show. Our full color graphic prints can effectively market your company in a professional manner. We also offer design services for company's that need assistance with graphic design. Our easy online ordering system will make your display purchase fast and simple. You can always call or email us at any time with questions about our products. Outdoor displays have a wide variety of uses. The most common is farmers markets and outdoor advertising events. Our tents work great for almost any outdoor booth location including festivals, car shows, fairs, and home shows. Outdoor flags work great for store fronts and sidewalk advertising. They are also used at indoor trade shows and fairs to grab attention. We offer a wide variety of outdoor banner stands that can be used at school, colleges, and universities to promote programs or fundraising. Sidewalk signs are ideal in high traffic areas like downtown city locations. Although there are many specific uses for outdoor displays, the opportunities are endless. Why did we choose this product line? Every outdoor display we carry has been carefully chosen with quality in mind. Outdoor displays need to hold up to weather and last in tough conditions. We do not offer screen printing, only full color digital printing. This way every product is developed with a great color profile without additional charges for more colors. That’s right, all of our outdoor products include full color digital printing with NO additional charges for more colors. There are never set up fees and turnaround time is among the fastest in the industry.